In this post, I’ll show how to send messages to a GHI Bluetooth module from a PC application using the 32feet .NET library. First of all, let’s create the Gadgeteer application. Connect an USB ClientDP and an OLED Display to a FEZ Spider Mainboard, as in the following screenshot. Click the popup and enter the PIN code to make the connection. You need to perform this task only the first time. Now that the Gadgeteer application is up and running, and the Bluetooth module is correctly configured, we can write a PC program to control it. Title="Bluetooth Control" Height="200" Width="400" ResizeMode="NoResize"
<TextBlock x:Name="lblStatus" Text="No Device" Width="200" VerticalAlignment="Center"
<Button Content="Search device" x:Name="btnSearchDevice" Grid.Row="0" Grid.Column="2"
<TextBlock Margin="10" Text="Message:" VerticalAlignment="Center" Grid.Row="1"
<TextBox x:Name="txtMessage" Margin="0 0 0 0" Width="200"
<Button Content="Send message" x:Name="btnSendMessage" VerticalAlignment="Center"
Grid.Row="1" Grid.Column="2" HorizontalAlignment="Left" Margin="5" Padding="5"
Then, download and add a reference to the 32feet.NET library (if you use NuGet, you can find it simply searching Bluetooth). 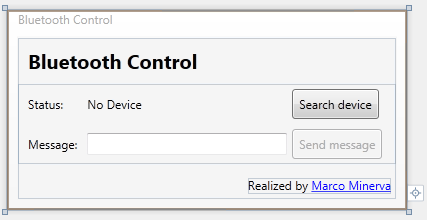 To manage bluetooth devices, we start creating a BluetoothClient object, contained in the InTheHand.Net.Sockets namespace. Then, we call the DiscoverDevices method, that returns an array of all the devices it finds. As we have called our device Gadgeteer, we use LINQ to search for a device with this name. If we find it, we set the PIN code and use the Connect method to establish a connection. It requires the device address and the Bluetooth service class to use. 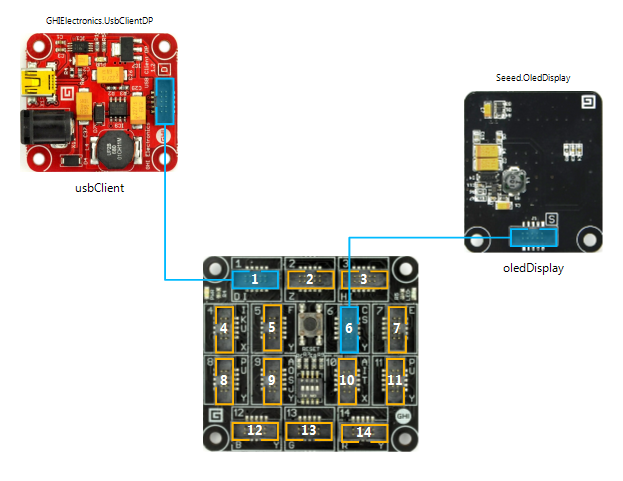 We must use BluetoothService.SerialPort, that identifies a service that provides a basic serial emulation connect over Bluetooth. Finally, we get the stream that allows us to communicate with the device. We simply get the bytes that compose the message and then we call the Write method on the stream object: the Bluetooth module on Gadgeteer device will receive the data and show it on the diplay. Both the Gadgeteer and the WPF application are avaiable for download. This entry was posted on April 21, 2012, 3:00 PM and is filed under Embedded Microcontrollers. You can follow any responses to this entry through RSS 2.0. You can leave a response, or trackback from your own site. Very Useful, could you show an example, how to receive the sensor data from Gadgeteer to PC via the Bluetooth module? Thanks. It’s really simple: from Gadgeteer, you need to use the client.Send method. Then, the PC application can invoke the bluetoothStream.Read method to read the data. Nell’applicazione wpf come fai a rilevare se sul pc il bluetooth è acceso o spento ? Puoi realizzare tutti i controlli che ti servono con la classe InTheHand.Net.Bluetooth.BluetoothRadio. La sua proprietà IsSupported ti dice ss il PC dispone del Bluetooth. In caso positivo, leggendo il valore della proprietà PrimaryRadio.Mode, puoi sapere qual è la modalità corrente: in particolare, per sapere se è accesso o spento, devi controllare se Mode è uguale a PowerOff. Apologies in advance if this is a stupid question (I am new to .NET), but how exactly do I add Eduardo’s Bluetooth class to the Gadgeteer libraries? If you download Marco’s project from this page, everything you need to build the library is there in the namespace Gadgeteer.Modules.Velloso. Eduardo Velloso is the developer who designed the driver. I test your project but not work. I don’t have Bluetooth on my PC now, so I use my ipad2 to find the bluetooth device. But I can’t find the “Gadgeteer”. Have you tried resetting your Gadgeteer device? Some times, the discover may fail, and the module takes some second to become discoverable. I use a usb bluetooth dongle in My PC. But why My ipad can’t find the Gadgeteer but the PC can. I don’t know how iPad works, sorry. I think can may try asking this question directly to Eduardo Velloso, because it seems to be related to Bluetooth Module discoverability. Thanks, I have contacted Eduardo Velloso. He also don’t know the iOS too. Maybe you can help me to check your phone also. Another question is , does the 32feet.NET can works on ASP.NET web Form? I am trying use website to control the Bluetooth NETMF device. No, you can’t use the 32feet.NET library with ASP .NET, because it needs direct access to hardware resources, that can’t be used from a Web Application. I have discovered that iPhone and iPad devices can connect via Bluetooth only to other iPhone and iPad devices, so it is normal that your iPad can’t find Gadgeteer. It is by design. How can I add two-way data transfer to this example so that I can also send data back to the PC from the gadget? Read my first comment to this article, I have described the methods you need to use. Thank you for taking the time to create these tutorials and also to share your design. Having real world examples are especially helpful to persons such as myself who are beginners. I am new to C# and also to the Gadgeteer platform. My Main-board is the Fez Cerberus. I am attempting to connect to my PC (using a USB dongle) from the GHI Bluetooth module (as you have done in your example). I however do not have the Seeed oledDisplay (so I’ve commented out that part of your code). All I can figure is that I am missing a library file of some sort? I have downloaded the driver from Eduardo Velloso and pointed to the Bluetooth.cs file under resources in my MSVS Project. Thank you for taking a look at my issue, any assistance that you can provide would be appreciated. Hi! Can you show me the line of code that causes this error? I have an issue inth these 2 lines,Why this happen.